to the extent that even took over my heart. and after that sinking completely in each others warth. In my mind the colors have suddenly appeared." I draw this/made it 2weeks ago, and decided to finnish it and waited a couple of day before submitting it, I have ALOT of unfinnshed works ^_^; . the trees are from an stock I edited. decated to winter^_____^ its so cold! thank you so much for viewing and please comment! Mmmm this wallie has a really soft and calm mood, I can feel the breeze! 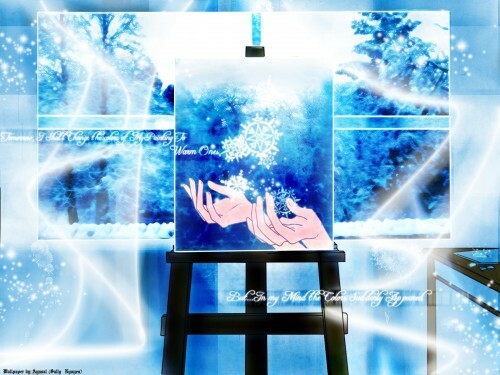 Haha, this so lovely sweetie, the snow looks so decorative and mystical~ You should work on the table and easel more but I know how tired you are on making this wall. It's beautiful, a definite favorite! This is awesome! Not only is the bg beautiful, but the hands! I can't draw hands to save my life! What a beautiful X-mas wallie :) I really love it! it's so original and so cool! the colors are peaceful and matching perfectly for the occasion also the drawings are nicely done! and the stock images you used are nicely cleaned and well displayed! you did an outstanding job Aya-Chan! Wow this is really pretty, it's like a frame, within a frame, within a frame. Is the middle frame like a window? Why is there like a blue streak down it's middle and stopping at the painting? oh, this is such a beautiful winter themed doujin! it has such a cool and refreshing atmosphere, as well. it looks so pretty! good job! Quote by bblsoh, this is such a beautiful winter themed doujin! nyaaa it is soo different Ayasal-chan! but I likes! your wallies are always pretty and blue colors gives a nice and ice mood on background! gonna add on my favs!